This discovery could help scientists understand how galaxies evolve. An international team of scientists has discovered discrepancies in our theories on star formation. 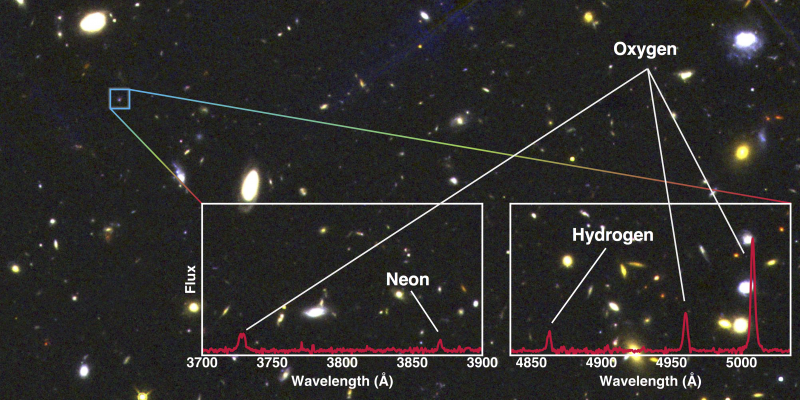 When the team used the W. M. Keck Observatory in Hawaii to study the role of metal content in the star formation rates of distant galaxies, they discovered metal content in these galaxies is similar, regardless of the galaxies’ star formation activity. The scientists were studying 41 normal star-forming galaxies that were 11 billion light years away using the Multi-Object Spectrograph for Infrared Exploration (MOSFIRE) instrument installed on the Keck I telescope. They saw that typical galaxies forming stars in the Universe two billion years after the Big Bang have only 20% of metals (elements heavier than helium) compared to those in the present-day Universe. They also discovered that the metal content is independent of the strength of the star-formation activity—in stark contrast with what is known for recently formed, or nearby galaxies. The amount of metal that forms in a galaxy is the result of a complex interplay between gas coming into the galaxy, star formation in the galaxy, and gas outflowing from the galaxy in the cosmological context. Knowing the amount of metal a galaxy forms, and how that correlates to star formation activity, is fundamental to understanding how galaxies evolve in a distant Universe. According to prior understanding, scientists would have expected a higher metallicity in less active star-forming galaxies than what was found, as part of the normal stellar and galaxy evolution. These new findings reveal that the role of star formation is not as strong at great distances, as it is at zero. This lack of influence of the strength of star formation in the metal enrichment in distant galaxies implies that the physical condition regulating star formation in galaxies in the early Universe is possibly different from that seen in the present-day Universe.